Those considering moving to Texas may want to take a look at Austin. There are many things that you may not have known about the state capital. With nearly 1 million residents, Austin is high on the list of the nation’s fastest growing cities. It is a great city for job seekers, students, and families. With many lakes, parks, and gyms to get out and active, Austin is considered fairly green and fit. If the outdoors aren’t your thing, there are a multitude of other attractions to check out. For one, Austin is well-known for its music scene of country, blues, and rock. If you are convinced that Austin is the place for you, then it may be time to pack your bags. However, with an easier method to get you and your car to your new home, there is no need to drive. Fly to your destination, and ship your car, instead. The most common reason to ship a car is because of a relocation. Maybe, you recently received a new job offer or are looking for more space to fit your family’s needs. However, there are many other reasons to ship a car. Here are a just a few. When students go off to college, having a car to drive to and from campus is beneficial. Road trips can be fun, but they also present many risks, as far as traffic, accidents, and poor weather. Therefore, parents can choose to ship their child’s car to college. This provides a safer, faster, and easier way to have your vehicle while at school. Learn more about How To Ship A Car To College. Retirees often relocate to better fit their changes in lifestyle. In addition, snowbirds, or seasonal travelers, temporarily relocate to a warmer climate during the winter months. In each situation, car shipping can be of use to avoid a long drive to your destination. You can buy just about anything over the internet, including cars. When your local dealership does not have what you are looking for, you may be forced to continue your search online. Don’t worry, though. If you find the perfect car out-of-state, we will ship it for you. This way you don’t have to drive. Learn more about How To Ship A Car Bought Online. If you want to enter your classic car into a show, it is very important that it arrives in excellent condition. Not only are these cars held to high judging standards, but you also want to do everything you can to keep the value high. Driving thousands of miles can result in depreciation. In addition, you run the risk of paint chips and debris. Ship your car for optimum protection. Learn more about Classic Car Shipping. No matter where you are going, moving to a new city is a big step. If you have chosen to settle down in Austin, there are a few things that you might want to know. Check them out, below. Employment is the primary reason why people move to the area. Austin has been the home to many startup companies and has seen much economic growth over the years. Due to its job market, it makes for a great place for young entrepreneurs. A wide range of industries are represented in the city, including those from real estate, medicine, and technology. Some of the major employers include AT&T, Whole Foods, Walmart, and Apple. When it comes to education, it’s top-notch with high-ranking high schools, colleges, and universities. There are many schools to choose from to receive a higher education. However, the most popular of these is the University of Texas. The university offers many undergraduate and graduate programs in business, architecture, engineering, education, and more. Summers may be sizzling, with temperatures reaching above 100 degrees. However, locals take part in activities, such as tubing and swimming, to cool them off from the dreadful heat. Unlike other parts of the country, winters are bearable, with average temperatures in the 60s. This makes it so that residents can enjoy nature all year long. Besides being home to live musical performances and the best barbecue around, you will find that there is plenty to do in Austin. Here are just a few of the most popular attractions. Texas State Capitol – At one point in time, this was the largest capitol building in the country. It may not be that way now, but it still remains a true beauty. 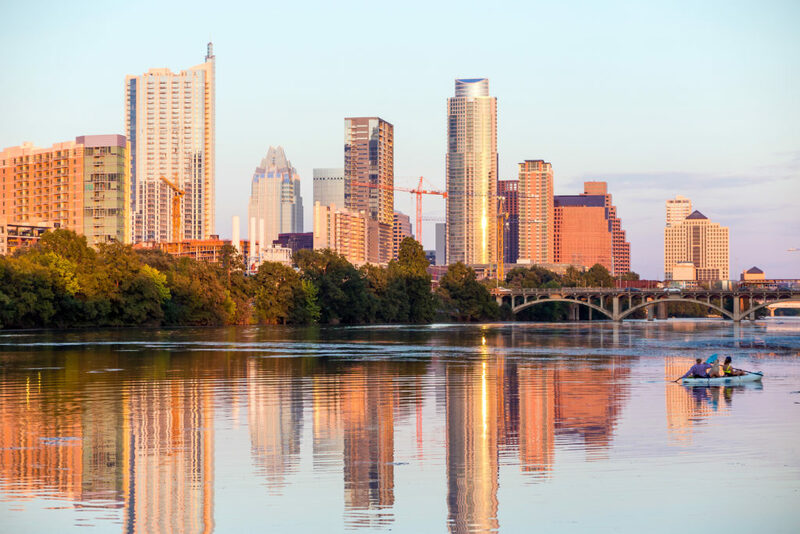 Lady Bird Lake – As we already mentioned, Austin features many lakes, parks, and green spaces. Lady Bird Lake, in downtown, is just one option to stretch your legs and go for a hike, jog, or run. Mount Bonnell – This park is more for those looking for a scenic view of the city. You may have to climb your way to the top, but the view is well-worth the effort. Thinkery – If you are looking for a family-friendly activity, this children’s museum offers just what you are searching for. It provides hands-on experiences through its numerous exhibits. Zilker Metropolitan Park – This park is a popular destination, because it hosts concerts, festivals, and more. There are also sports fields for use. National Dispatch is a nationwide car shipping company with a company-owned fleet. Both individuals and businesses utilize our car shipping services to transport their vehicles safely and quickly to their destination. We believe in providing the best customer service. This means keeping you updated every step of the way, so you have greater peace of mind during transport. Requesting a car shipping quote is simple. Use our quote form, located on our website, to get a free, instant car shipping quote. No personal information is needed. You can also call us at 800-321-2051 to speak with one of our auto transport representatives, or chat with us online.